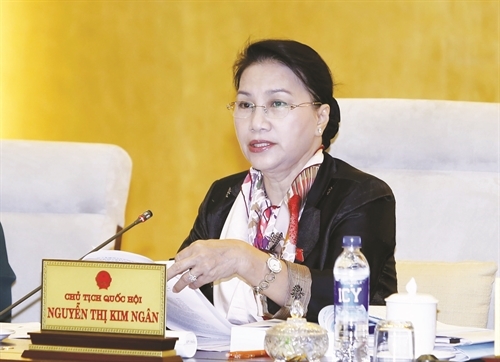 The draft Law on Associations should be presented to the upcoming session of the 14th National Assembly (NA), NA Chairwoman Nguyen Thi Kim Ngan said on September 22, the last working day of the third session of the NA Standing Committee. “We should not postpone the submission of the draft law but would put it before the NA deputies for discussion and passage,” she said. Ngan asked the law-drafting body to work hard on the draft and include in the draft effective and practical regulations on operation of associations, including associations involving foreigners. Concretizing Article 25 of the 2013 Constitution, the 44-article draft law contains specific provisions on the establishment, organization and operation of associations, state management of associations, and registration and management of the operation of foreign non-governmental organizations in Vietnam. It is expected to not only guarantee the citizens’ right to form associations but also ensure the state management of associations and foreign non-governmental organizations registered to operate in Vietnam. Most lawmakers agreed that the draft law needs to create favorable conditions for citizens to exercise their right to form associations and bring into play associations’ autonomy, use of volunteers and sense of responsibility. However, they said the draft law should regulate more specifically the state management of associations, particularly foreign-involved associations and unregistered ones, in order to ensure their operation to comply with the law. Le Thi Nga, Chairwoman of the NA’s Committee on Judicial Affairs, said associations that are not required for registration and those without legal person status all need specific regulations to ensure the respect for people’s rights and the state management of unregistered associations. Some legislators proposed strict regulations on the formation of associations in order to avoid the mushrooming of associations, which could cause difficulties to state management work, and avoid the abuse of formation of associations for illegal activities. Regarding the provision that allows foreigners working lawfully in Vietnam to join associations, NA General Secretary Nguyen Hanh Phuc said more studies are needed to ensure their rights are respected and their activities abide by Vietnamese law. During this session, which began on September 12, the lawmakers also gave their opinions on the draft Law on Belief and Religion and the draft Law on Asset Auction. They commented on other draft laws concerning technology transfer, foreign trade management, management and use of state property, and state compensation liability. Debating the draft Law on Belief and Religion, most lawmakers agreed with the provision that allows religious organizations to establish schools as part of the national education system, which will operate in line with the current education law. Phan Thanh Binh, Chairman of the NA’s Committee on Culture, Education, Adolescents and Children, said that in reality, many religious organizations have lawfully opened and effectively managed education institutions for children, with some 126,000 students attending about 270 schools currently operated by religious organizations. NA Vice Chairman Uong Chu Luu said more study was needed to ensure that education institutions formed by religious organizations refrain from teaching the content on belief and religion, with a view to guaranteeing the freedom of religion of each person. Concerning other social activities of religious organizations, such as charity, humanitarian relief, social protection, and healthcare, most legislators agreed that religious organizations have made great contributions to the society. However, some said religious organizations should ask for permission from the authorities in the localities where their social activities are carried out, adding that to respect people’s freedom of religion, religious organizations would not be allowed to conduct propaganda activities to expand and develop their religions. As regards the draft Law revising a number of articles of the Law on Technology Transfer, the lawmakers agreed that the revision is necessary to meet the demand of economic growth and international integration. Minister of Science and Technology Chu Ngoc Anh said the revision aims to facilitate technology transfer activities inside and outside Vietnam with a view to helping Vietnamese businesses enhance their production capacity and competitiveness in both domestic and overseas markets. He said the revision was made in the spirit of renewal of the state management of technology transfer in line with trade liberalization and international integration trends. Some legislators raised concerns over whether to amend only 16 articles of the current law or to revise the entire law, saying that with the current domestic situation of technology, revising only some articles of the current law would not meet the demand of national industrialization and modernization. After discussion, the NA Standing Committee agreed that the draft law revising a number of articles of the Law on Technology Transfer should be upgraded into the revised draft law on technology transfer. Discussed for the first time, the draft Law on Foreign Trade Management aims to serve as a tool of state management over foreign trade that ensures transparency and compliance with international law as well as raise the competitiveness of the economy. It is necessary to promulgate a law on foreign trade management in order to complete the legal framework for foreign trade activities, Deputy Minister of Industry and Trade Nguyen Cam Tu said. “At present, there are many legal documents on state management of foreign trade activities. These lead to overlaps in state management work and a lack of transparency, thus causing risks to import and export activities of businesses,” Tu said. The Committee agreed with the draft’s major provisions on state management of foreign trade activities, such as management measures, dispute settlement, and measures for foreign trade development. However, many legislators said the draft law gave too much power to management agencies, especially the Ministry of Industry and Trade. Phan Thanh Binh said the draft law regulates many kinds of licenses and gives a lot of power to the Minister of Industry and Trade, authorizing him to grant quotas and designate import and export businesses. Most lawmakers wanted the draft law to reduce power of the Ministry of Industry and Trade and increase support for businesses involved in foreign trade activities. The lawmakers said revision of the Law on Management and Use of State Property aims to ensure efficiency and thrift in the procurement, management, use and operation of public property, thus meeting the requirements on practice of thrift and combat of waste and corruption. Some legislators said the revised draft law seems to be infeasible if it is designed to cover all types of public property. They proposed the formulation of a code on public property or specific laws regulating certain types of public property based on the characteristics and sources of formation of each type of the property. To optimize the efficiency of the management and use of public property, the lawmakers suggested distinguishing between public property serving the State’s management work, public property for social welfare purposes and public property for commercial purposes while clearly identifying the subjects managing and using different types of public property. Le Thi Nga and some other lawmakers proposed the draft law be added with provisions on responsibilities and handling of heads of agencies or units that are assigned by the State to manage and use public property but let violations occur in their agencies or units. The draft law should also define the subjects eligible for, and criteria and norms of, furnishing of public property like cars, working offices and public-duty houses in order to avoid loss or waste of public property. The revised draft Law on State Compensation Liability should clarify damage and determine the level of compensation while simplifying procedures and shortening the time of resolution so as to raise the responsibility of officials on duty and guarantee the lawful rights and interests of related organizations and individuals, according to the lawmakers. Le Thi Nga said the draft law was extremely difficult so the lawmaking process should be carried out step by step and take into account all the cases to protect the lawful rights and interests of those affected by the State’s decisions. She asked the law-drafting body to clarify provisions on cases that would or would not be eligible for compensation. Nga also said the public complained about the large amount of state money used for compensation, but the draft did not mention the compensation liability of officials who made wrongful convictions. In reply, Minister of Justice Le Thanh Long said he did not make sure the revised draft law would solve all the problems. In terms of calculating damage for compensation, he said it was easier to calculate material damage than spiritual damage, adding that the drafting board had tried to set criteria to quantify spiritual damage. On principle, all civil servants involved must pay compensation, Long said, suggesting the law be reasonably designed to give them a sense of compensation for damage caused but it would not be so stringent that civil servants did not dare do anything. Tong Anh Hao, Deputy Chief Justice of the Supreme People’s Court, said most cases of wrongful conviction faced slow compensation due to difficulties in identifying the agencies responsible for compensation. Moreover, most of the victims could not prove their damage, which remained the most complicated task. Meanwhile, Deputy Procurator General of the Supreme People’s Procuracy, Le Huu The, said it was necessary to have a benchmark to calculate the level of compensation, noting that the provisions on compensation were not clear enough, thus causing inconsistencies between agencies responsible and persons eligible for compensation.